Much has been written over the past few weeks in response to the suicides of celebrities Kate Spade and Anthony Bourdain. Words of sorrow, confusion, and even judgement have attempted to make sense of the harrowing choice that some people make to end their lives, and the devastation that their deaths leave behind for those who remain to grieve. I don’t pretend to have any new insights or wisdom about the reasons behind suicide, nor about how to prevent it. Though I have been a mental health professional for more than half my life, I still struggle to understand the mental mechanisms that tumble into place just so, resulting in the decision to end one’s life and the capacity to follow through on that plan. I counsel people who fight the thought of self-inflicted death on a daily basis, and I am viscerally aware of the despair and hopelessness that can make that choice seem like one’s only viable option when pain is overwhelming and appears unceasing. But I also know that pain, like joy, is impermanent. In reality, no experience remains the same from moment to moment. I am reminded of the message of the It Gets Better campaign begun more than a decade ago to address an alarming spate of suicides by young people who were bullied about being, or appearing to be, gay. Writer Dan Savage and his husband, Terry Miller, founded the organization to provide hope to people struggling with fear that their pain would never cease. 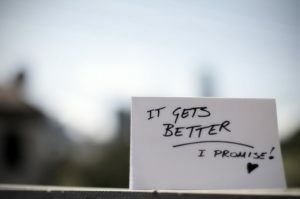 It Gets Better promised that, as long as we hang on and move forward, things will get better. Maybe not tomorrow. And maybe only incrementally. For now. As long as we can make the choice to face the next day, the next hour, the next moment, we provide ourselves with the opportunity that things can get better. Our pain may relent. Our fear may recede. We may hear from a beloved, or receive a sloppy kiss from our pet. We may glimpse the wonder of a bee buzzing near a flower, or see the promise in a child’s eyes. No one can promise us that pain won’t return, that we won’t face struggle, challenge and even despair again, perhaps innumerable times. But as long as we choose to inhabit this moment, to allow ourselves the chance to experience the next ​moment, we give ourselves the only opportunity we have to experience what may be. Some of those moments may be bleak and scary, but many will be graced by joy and peace and delight. For the hope and promise of those moments, I pray that we will all choose to hang on.